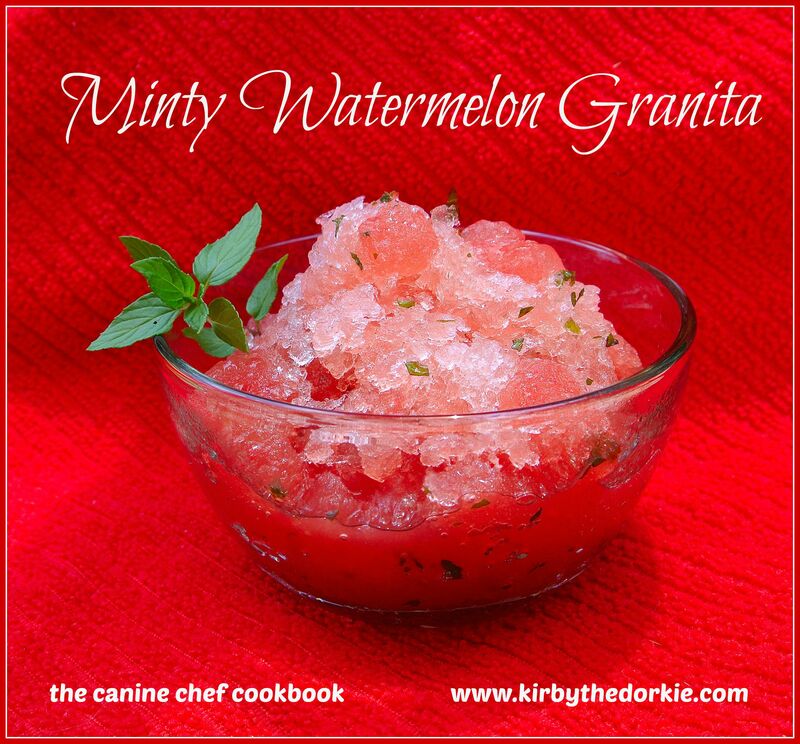 Quench your canine's thirst with a delectable watermelon granita! The Canine Chef, Kirby the Dorkie, is back with another delicious watermelon recipe! Today's summertime treat is a cooling and refreshing watermelon frozen drink that any dog is guaranteed to love. These frozen ice drink also makes a great treat for the kids (of all ages). Read the recipe below, and then be sure to follow Kirby the Dorkie on Facebook and check out KirbyTheDorkie.com for more great dog recipes! 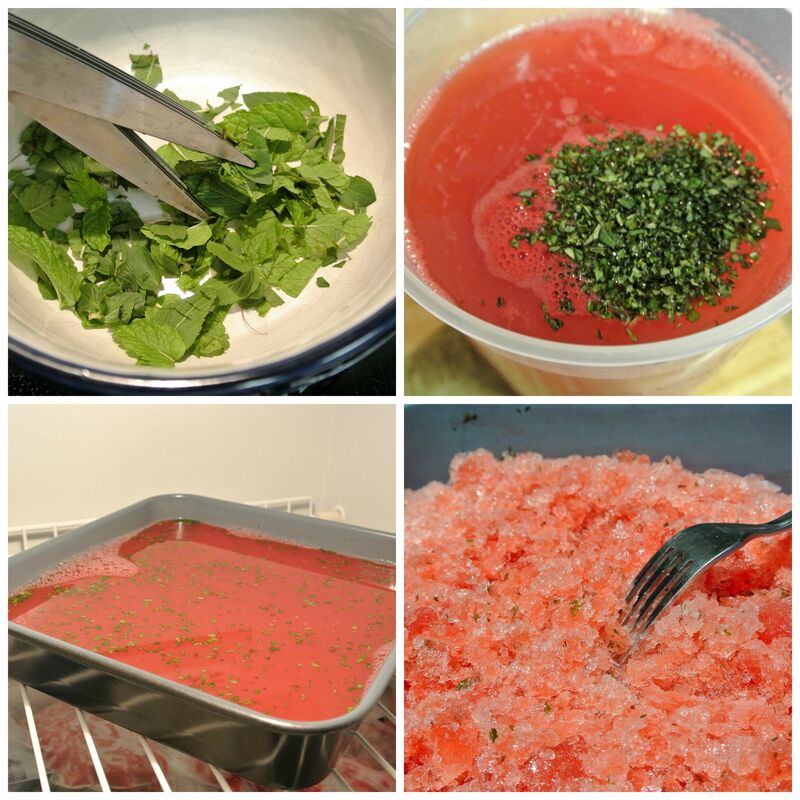 Puree the watermelon in a blender or food processor. Strain the juice through a wire mesh sieve to separate the pulp and tiny black seeds. I don’t worry about the tiny white seeds that may get through. You will end up with roughly 6 cups of watermelon “water’. Pour into a 13" x 9" metal or glass pan and place in the freezer. Let the mixture freeze for about thirty minutes and then scrape with a fork to break up the frozen part around the outer edges creating shards of ice. Repeat every thirty minutes for about 2 to 3 hours or until it’s a completely frozen mass of crushed ice. Kirby used half of a large seedless watermelon for this recipe. The half equaled roughly 6 cups, so your watermelon output may vary depending on its size. This is shared by humans and canines so we’ve never had any leftover but you can store it for a day in the refrigerator. Refreeze and scrape or strain the mint and drink it. Freezing at this stage will form a solid block of ice. You can spoon the pulp into small silicone molds or ice trays for refreshing pupsicles. Did you make this recipe? Snap a photo of your creation of this recipe and share it in the comments below! If you altered the recipe, tell us what you did and how that worked out for you. Don't forget to share your photo on Instagram and tag @EntirelyPets!